Buying flowers for the altar. Photo by Ted McGrath / Flickr. 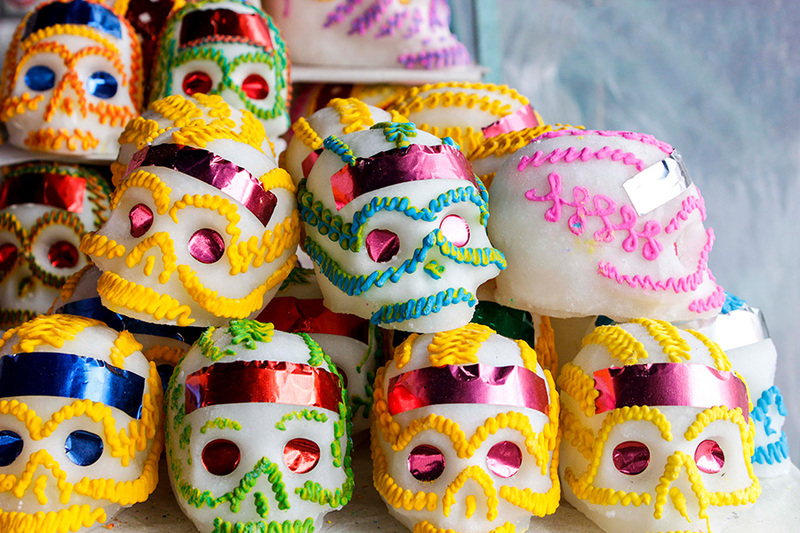 It's the season of Dia de los Muertos — when Mexicans celebrate the life of the dead. It's festive, it's colorful, and it involves candy. Anyone can build a traditional Mexican altar. Here's how. Día de los Muertos merges Spanish and indigenous Mexican traditions of sacred devotion in a colorful demonstration of remembrance of people that are no longer with us. This is one of the most beloved holidays in Mexico, and extremely bittersweet. 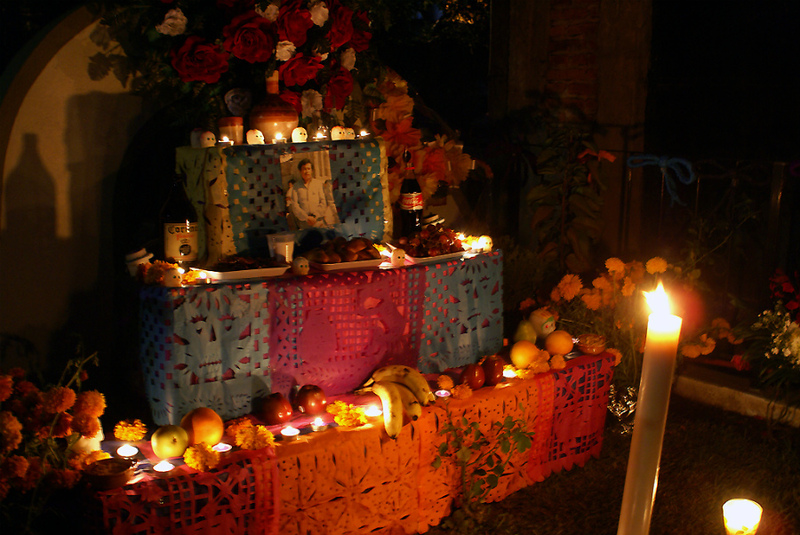 Typically, families build an altar for deceased relatives outside their homes. Institutions like schools make altars for extraordinary people (like authors and artists). Assembly of the altars happens at the end of October, before the souls return to the mortal world on October 28. Ghosts arrive in an orderly manner: First, those who’ve died a violent death, then un-baptized babies and children. The souls of people who led exemplary lives arrive to the mortal world on November 1, Día de Todos los Santos. The altar usually stays up until November 3, though sometimes they are left for a few more days. Ideally, an altar has seven tiers or steps (symbolizing the route to heaven), each decorated with different trinkets and symbols. Most families construct a three-tier altar representing the division between heaven, earth, and purgatory. The altar can be as simple or as extravagant as you wish; the important thing is devoting time to the memory of loved ones. Anyone can build their own. 1. Make your base. Get tables or boxes of differing heights. Stack one on top of the other so that it looks like a set of bleachers or stairs. Cover with a petate (tablecloth) and decorate with papel picado (colored tissue paper cut into elaborate designs). 2. On the top tier, place portraits of deceased loved ones. Portraits are often placed across from a mirror in a way that viewers can see the reflection. A cross or other religious items can also be included here. 3. Use the middle tier to pay homage to your loved one’s favorite hobbies, meals, and personal items like pan de muertos (a traditional bread), sugar and chocolate skulls, fruit, trinkets, and candy. 4. The bottom tier should include a vessel with water to relieve the thirst of the spirits after their travel to the mortal realm; salt, to purify and prevent the spirit from corruption on its way back to the spirit world; copal or incense, to cleanse the space of bad spirits and ensure loved ones arrive safely; and candles, to help the souls find their way back home (in indigenous communities, the number of candles is related to the number of spirits they want to welcome home). The color represents the condition of the family, i.e. purple for mourning. Four candles may be placed in a cross to represent cardinal points — so the anima can orient itself. 5. Add flowers to each tier. Their vivid colors and scents decorate and perfume the altar while the souls are visiting, making them happy. Include a trail of petals on the floor to help them find their way to and from the cemetery. For the children’s altar, use alhelí blanca (hoary stock), nube (baby's breath), or any other white flower to signify the purity, innocence, and tenderness of the visitor. 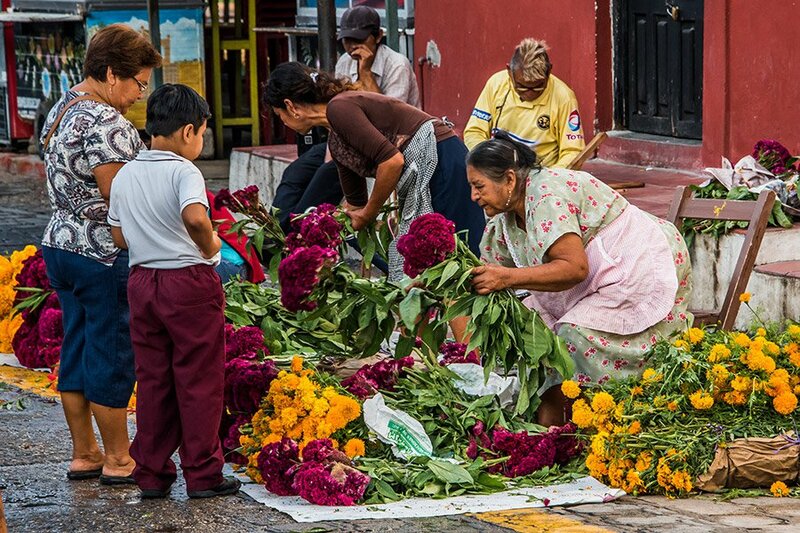 For adults, use cempasúchil (Mexican marigold), which is representative of the festivity. 6. To finish, draw a cross of ash on the floor to help the spirit arrive and atone for any unresolved guilt. Leave in peace. 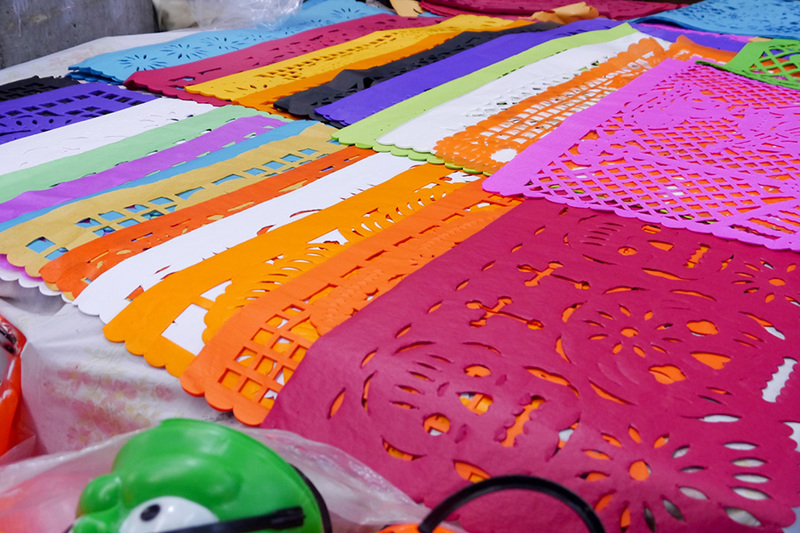 Papel picado. Photo by Haydee C. / Flickr. Sugar skulls. Photo by Pao Martínez/ Flickr. Completed altar. Photo by Ute / Flickr. Helena is an editorial intern at Fathom. You can follow her on Instagram at @erraticphotography, @anotherpaintinthewall, and @hele91. She travels for inspiration and everyday craziness.